Adds Organic Matter: As the cardboard breaks down, it adds biomass to the soil, which improves soil texture, drainage, aeration and structure. Make sure to water the cardboard so it doesn't blow away. 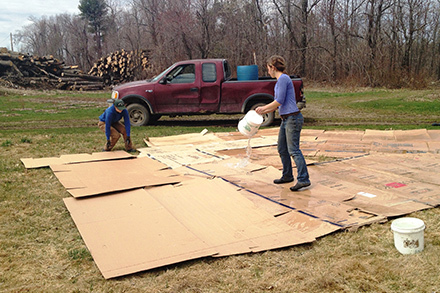 Prevents Weeds: The cardboard provides a physical barrier between the soil and the sun, preventing weed seeds from growing and smothering existing weeds. Attracts Earthworms and Microbes: Cardboard is a great food source for soil microbes who are the tiny creatures responsible for feeding your plants. Earthworms also love it; they feast on the protein-rich glue that holds cardboard together. Alternative to Tillage: Sometimes there is a reason to till, but we are helping the soil if we can avoid it. Turning the soil kills microbes, burns up organic matter and destroys earthworm tunnels, microbe habitat and the roots of very important fungi called mycorrhizae. And last but not least: It’s free! Cardboard being prepared with compost and hay. At Heifer Farm, we transformed sod into soil and planted our pumpkin patch without any tilling—no tractor, no rototiller—just cardboard! We also have permanent beds in our 1-acre production field, often using cardboard there as well. It’s easy, fun and makes a great group project—the largest Tetris game you’ll ever play. 1) Call local stores and ask if they have any cardboard. We’ve had good success with furniture stores. Remove the tape, and avoid waxed cardboard. 2) Mow the grass if you are breaking new ground. Then, place the cardboard on top, overlapping the edges about 6 inches. Use a hose to wet everything down so it doesn’t blow away. 3) Mulch the cardboard with compost, leaves, grass clippings, straw, seaweed, hay or whatever you have on hand. Adding mulch layers keeps the cardboard from drying out which would inhibit gas exchange of the soil (how the soil breathes). It also keeps the cardboard in place, further prevents weeds and provides even more food for the microbes. 4) You can plant into the cardboard right away if there is soil underneath by simply using a spade to cut a hole through the cardboard. If you started with sod underneath, wait until the grass is dead before planting—anywhere from one to six months. Start this process now to have a new garden space ready to go for the spring. That’s it folks! Sit back and relax while the microbes and cardboard go to work. Have questions on using cardboard in the garden? Email me at elizabeth.joseph@heifer.org.